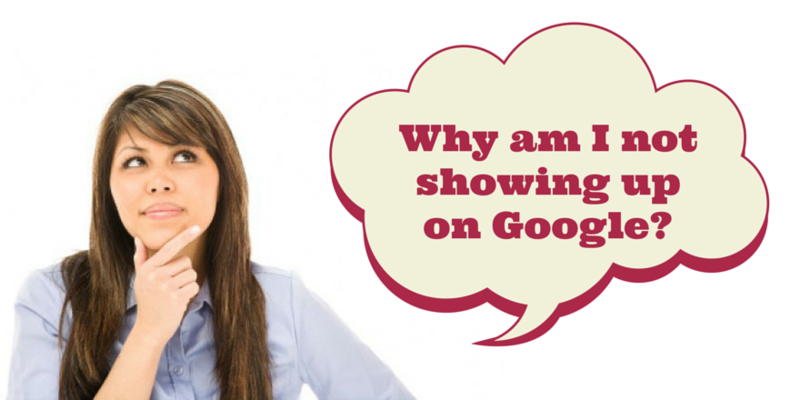 The struggle of any business or website owner… getting noticed by Google. It’s a big deal, i mean, if it’s not on Google, does it even really exist? Sometimes it can take up to two weeks for search engines to index your website, even if you have submitted a sitemap to them. This is because your website is new or it has had a major makeover recently. Do not worry too much about this initially as it is totally normal. However, if you’re not seeing anything after a couple weeks, you may have a different issue. After you’ve published your site online and submitted it to Google, a crawler will be sent out to your website to have a look around and read through all the content. These crawlers scan your site for all sorts of information like keywords and duplicate content to ultimately return back to Google, or any other search engine, with a sort of rating that determines whether the site meets specific criteria that search engines favor, for example having keywords used enough but not too much. Search engines are very picky about such issues. Relevancy is also a big deal when it comes to the search engine crawlers. If the crawlers are finding a lot of words and other content that have nothing at all to do with what your site is all about. Try to keep your content on topic. Meta content is hidden code that the viewer of the website can’t see, but the crawler goes through all of it. It is very important that this meta content is there and is relevant as well. If you’re not sure about whether this is the case for your website it is best to speak to the person who made it and have them go through it with you. This issue has two main factors. The first being the visual quality of your website, it needs to look nice, work nice and not be confusing or difficult to navigate. It’s important for your site to look and feel nice for so many reasons so if your site is falling a bit behind the times an updated site could do wonders for your business. The second factor is the textual content of the site. Google and some of its competing search engines are able to rate the content you’ve written on your site for various faults inclusive of how easy it is to read, how relevant it is to what your site is listed as doing and an overall quality of the information on the site IE is it useful to someone. At the end of the day, Google wants to please its users by giving them the search results with the best information about what they have searched and if your site doesn’t do that, then chances are, you could end up buried in the search results under your competitors who have spent more time on their content. Search Engine Optimisation is absolutely crucial when trying to get your site to appear on search engines like Google, especially for small businesses. This is what determines whether your business comes up on the first page or your competitors’ business comes up. If you’re unfamiliar with what SEO is you can click here: ‘What is SEO?’ to learn more about it. If you’d like help with SEO you can contact us to talk about how we can help you and your business. If none of the above applies to you, it could just be that the keywords you have chosen to help people find your site are just too competitive. Meaning those same keywords have been chosen by potentially tens of thousands of other businesses, many of whom have bigger advertising budgets than you, and this is fine, this can be fixed and Google has already offered to help people with this problem. Keyword Planner is a tool that Google themselves have provided which allows website owners and developers to view which keywords are the most competitive and which keywords will produce the best result. You can view the Keyword Planner here. It is important to know also that keywords are progressive, so don’t stress if you can’t conquer the keyword you want, move on to the next one, conquer that and come back later to the other keyword, stronger than you were. Hopefully those struggling with this issue can use this article to help climb Google’s pages and dominate their market. If you’d like help with your website head to our contact page and let us know or leave a comment below. Good luck website owners!